Thomastown Town is located in the South-East of Ireland in County Kilkenny. Thomastown is an old market town set in the beautiful valley of the River Nore. Thomastown was once a centre of trade and a military stronghold. Thomas Fitzanthony from whom the town takes its name was the Anglo-Norman seneschal of Leinster. The main feature of the town is the parish church which was founded by FitzAnthony in the 13th century. Close to the town are the ruins of the Cistercian Abbey of Jerpoint. The Abbey is regarded as some of the finest ruins in Ireland. Also close to the town of Thomastown is the Mount Juliet Estate, home of the world famous championship golf course. Aeroplane: Dublin Airport is the closest airport to Thomastown Town - 140km. Click here for details on Irish Airports. 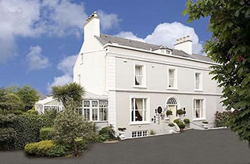 Finglas House is a modern family run bed and breakfast located in the centre of Camp Village along the Dingle Peninsula.Scenically located overlooking Tralee Bay on the Dingle Way Walking Route.An ideal location for a touring or walking holiday.